Yemen's government tells UN it would agree to a truce if key "guarantees" are met. Yemen's government told the United Nations on Wednesday it would agree to a truce to end more than three months of fighting provided key "guarantees" were met, Reuters reported. "The Yemeni authorities have informed the Secretary General of the United Nations Ban Ki-moon of its agreement to implement a truce in the coming days," the spokesman, Rajeh Badi, told the news agency by phone from the government's seat of exile in Saudi Arabia. Yemen's President Abed Rabbo Mansour Hadii, the spokesman said, had "set guarantees for the success of the truce". These included the release of prisoners by the Houthi rebels, including the loyalist defense minister, as well as the Houthis' withdrawal from four southern and eastern provinces where they are fighting local militias. 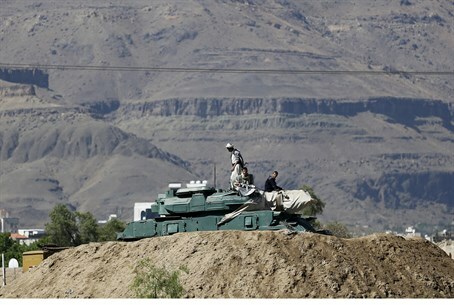 The United Nations has received a letter from the Yemeni government and was "seeking clarification from the parties," said Ban's spokesman Stephane Dujarric, according to Reuters. There was no immediate comment from the Houthi movement on the government’s conditions, noted Reuters. The Houthis have not yet accepted a UN Security Council Resolution passed in April which recognizes Hadi as the legitimate president and calls on them to quit seized land. More than 3,000 people have been killed in the conflict and over a million displaced, and the UN has been urgently pushing for a pause to help impoverished people. "We're optimistic (the Houthis) will agree, because this will guarantee the sending of aid to Yemenis," Badi told Reuters.